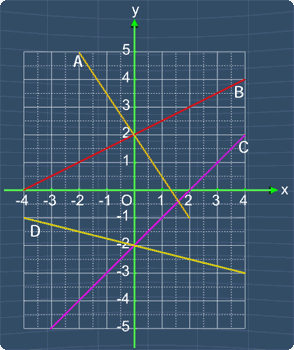 A line will slant upwards to the right for m > 0 and the slants upwards to the left for m < 0. You can look at the pictures below to understand better. 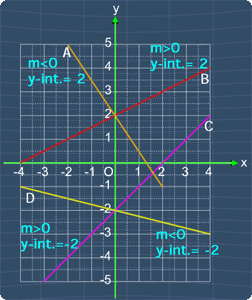 Next, y-intercept is the y-coordinate of the point that the line crosses the y-axis. The picture on the right will help you to understand this better. With what you have learned in Step 1 and Step 2, we can start to label the slope and y-intercept for all the lines as shown in the picture. From this, only line C has m > 0 and y-intercept = -2. Clearly, the answer is C.